If you are looking for the perfect healthy vegan-friendly snack, a light, fresh appetiser or even food that is great for travelling or picnicking, this is the recipe for you. These Vietnamese spring rolls are super fresh, super delicious and are fun to make. 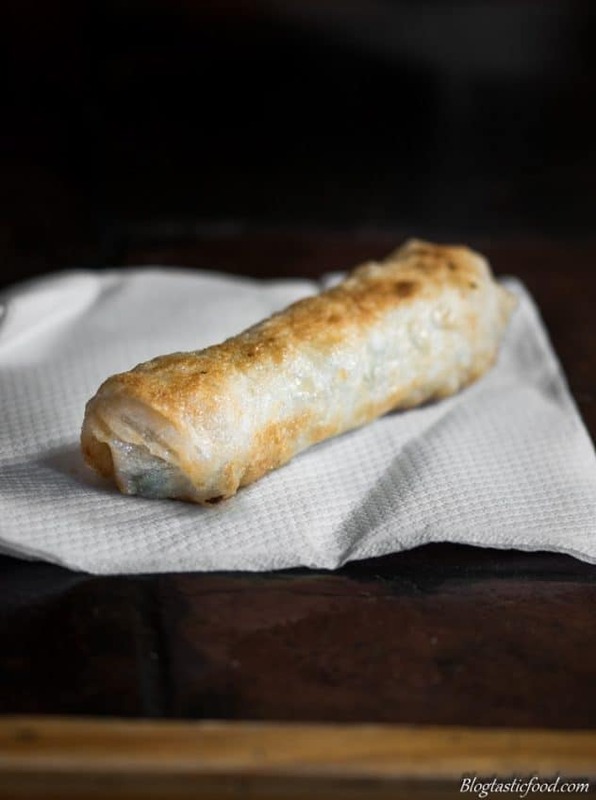 The first thing that comes to most peoples minds when they think about spring rolls is deep fried wrapped filo pastry. Which is amazing don’t get me wrong. However, it’s nice to change things up a bit. And for me, these fresh rice paper rolls is kind of like a spring roll remix. Snacking on a lot of these for lunch is a great way to be healthy, as they are filled with vegetables, herbs and greens. However, they become a healthy treat once you dip them in the peanut satay sauce. That little bit of richness, saltiness and that light chilli that hits the back of the throat makes everything come together so beautifully. There is a little bit of brown sugar in this dipping sauce. So if you want to keep this recipe as healthy as possible, you can replace the sugar with honey. Just keep in mind that as great as these spring rolls are, you’re missing out if you don’t have them with the sauce. 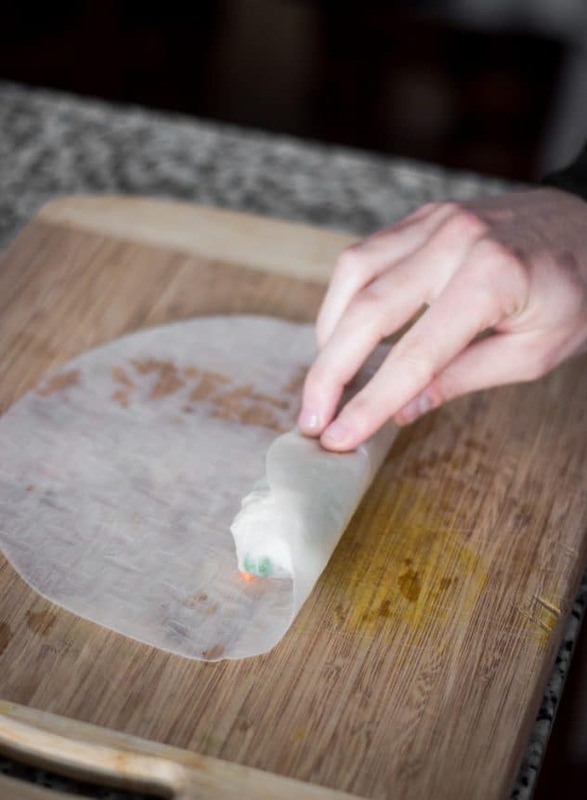 The most important thing to know when it comes to rolling ingredients in rice paper is that you should aim for a tight, firm roll. The thought of a loosely filled spring roll that flops around everywhere isn’t super attractive, is it? 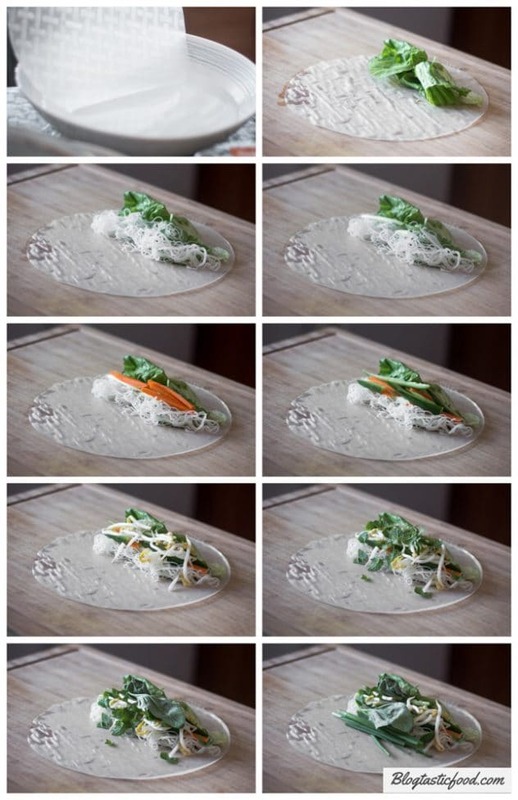 Here is what the process should look like…..
First, you want to place the ingredients on the rice paper in a nice neat bundle. Notice, as I start to roll the rice paper over, I make sure the ingredients are firmly bunched up together. Once again, this is key. Rolling rice paper rolls is kind of like cooking pancakes in that the first 1 or 2 are usually a bit awkward. Then you eventually start getting good at it and before you know it, you’re on a roll….(haha!! See what I did there?). 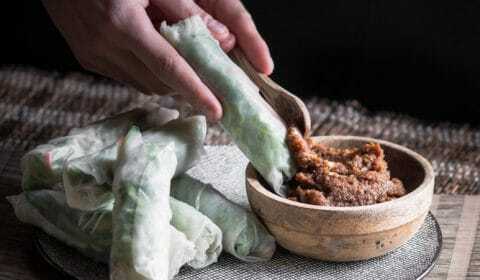 Can you cook Vietnamese spring rolls? These are classically served raw. However, I did some experiments in the kitchen and I came across 2 effective ways to cook these. You can either fry them or steam them. Although you need to be careful that there are no holes or tears in your spring rolls, otherwise they can fall apart really easily. So if you do plan on cooking these, you can double roll any spring roles that have tears. This worked out really nicely for me. Here are the two cooking methods you can use for Vietnamese Spring Rolls. Shallow fry or deep fry in a non-stick pot/pan – The non-stick part is important because the roll will stick to the bottom or the sides when working with stainless steel pots/pans. Which can cause the delicate rice paper to break and if that happens, well….let’s just say that you may not have a roll any more. So get your oil nice and hot over high flame (put some bread in the oil to test if it’s ready. If it floats and bubbles, that’s a sign that you’re ready to fry). 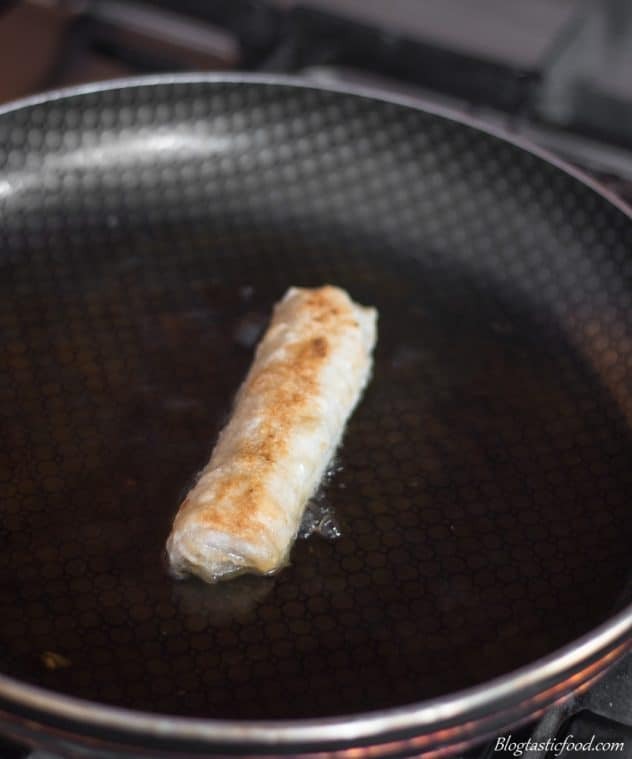 Fry your spring rolls for 2-3 minutes on each side or until golden brown all over then drain on kitchen paper. Steaming the Spring Rolls – This is obviously a much healthier cooking option. The first time I tried steaming the spring rolls, the rice paper stuck to the bamboo surface. So when I attempted to lift it up, the rolls fell apart. So on attempt number 2, I put baking paper in the steamer and then I sprayed it with cooking spray to make sure that the roll doesn’t stick. I then steamed the spring roll for about 4-5 minutes and honestly, I really liked the results. And it’s as simple as that. Although I have to make one little side note, be careful because once you steam your rolls, the rice paper develops a slightly sticky texture. So be gentle with them and make sure the rolls don’t stick to one another. 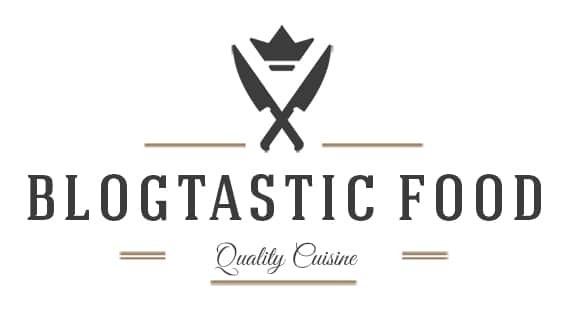 Thank you so much for checking out this post. If you like this Vietnamese spring roll recipe, don’t forget to rate it in the recipe box below. You may also want to check out this Vegetable Fried Rice recipe. Other than that, take care and have an awesome day!!! 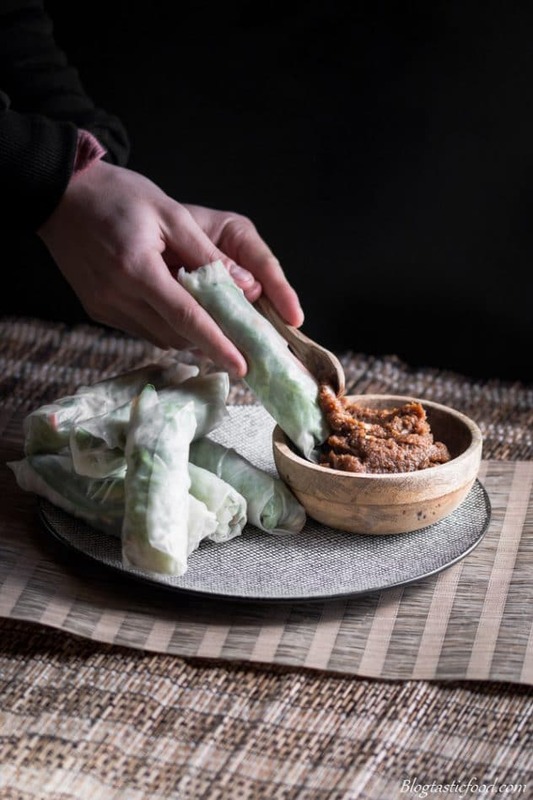 Really fresh and vibrant rice paper rolls served with the most flavourful peanut dipping sauce. 100 g of vermicelli rice noodles steeped in boiling water for 2 minutes then drained. 1 Lebanese cucumber cut in half length-ways cored with a spoon and then cut into matchsticks. Pre-heat a small pot or pan over low-medium heat. Add your sesame oil and your chopped garlic. Gently fry for about 1 minute. Next, add your peanut butter, your soy sauce, your coconut milk, your brown sugar and a pinch of chilli powder. 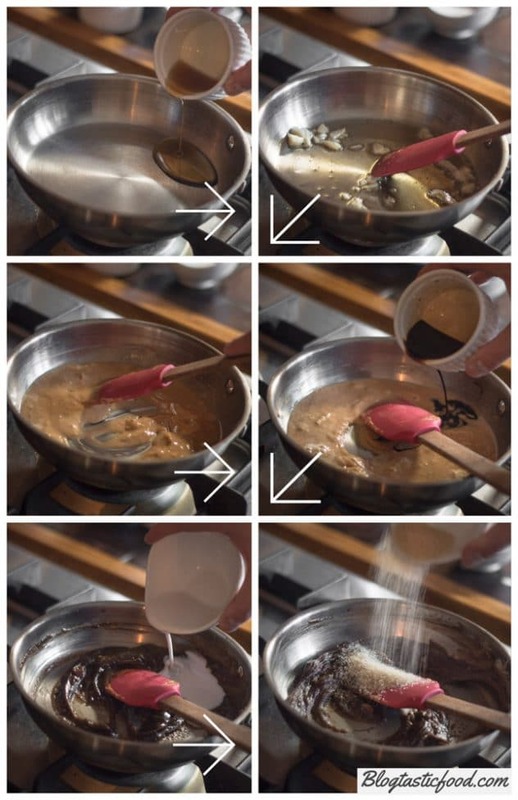 Stir on low heat until the sugar has dissolved and all the ingredients are well combined. Turn the heat off and set aside. Have a bowl of cool water, a clean chopping board and all of your chopped and weighed out ingredients ready and neatly placed out on your work surface. 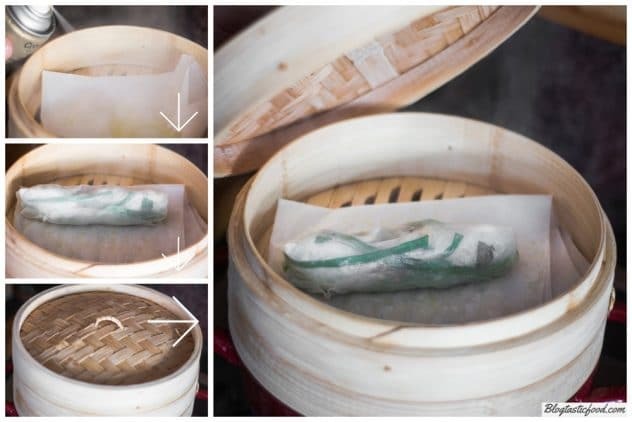 Quickly dip the rice paper roll in the bowl of cool water, then let some of the excess water drip off before placing it flat out on your board. Start neatly placing your ingredients on the rice paper roll. I placed the ingredients in this order. I added some lettuce, some rice noodles, a few slices of spring onion, some carrot, some cucumber, some bean sprouts, a few mint leaves, some Thai basil and a few sprigs of chives. Fold the edge of the rice paper over the filling while firmly tucking in all of the ingredients. 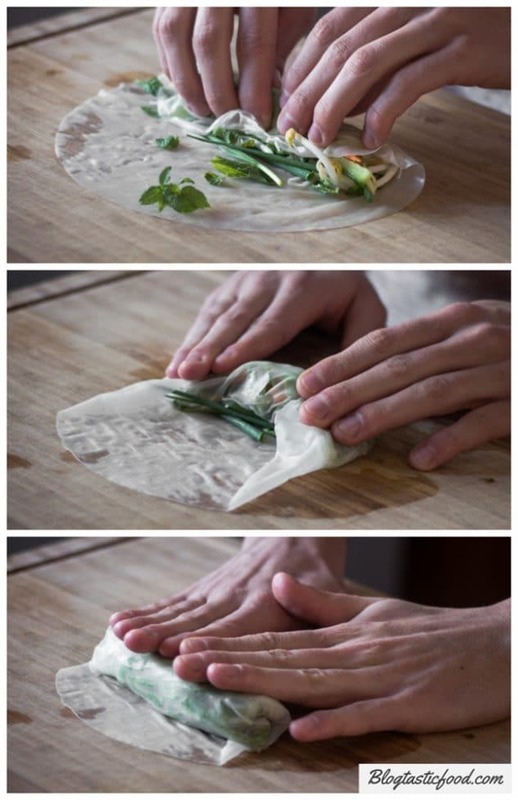 Tuck the sides of the rice paper in and then finish rolling up your spring roll. (look at the pictures in the post if you are confused). Roll the rest of your spring rolls. Serve with the peanut dipping sauce and enjoy. Remember, If you find it hard to follow the recipe when rolling the spring rolls, look at the pictures in the post for guidance. If you want to fry or steam your spring rolls you can. However, you must be aware the spring rolls are delicate and if any of them have tears, you may want to consider double wrapping them. A firmly sealed spring roll ensures that it won't break whilst being cooked. Thnaks so much! (: Yes I think the biggest key is to actually have all the ingredients prepared, cut and ready, and once you have dipped them in the water you gotta be fairly quick to put the ingredients on and wrap them, because the longer you leave them the more they will stick. The one that you see wrapped on the post almost failed because I took so long to wrap it as I was taking so many pictures of it lol. Hi! I actually prefer the use of regular basil vs. thai because uncooked thai basil is extremely potent and overpowers all the fresh flavor you have going on in these rolls. I’ve attempted making these before but was not successful. I grew up rolling lumpia all my life and have not quite learned to finesse the rice paper as you do (since lumpia wrappers are very forgiving and like a little bit of man handling). Anyway, great post, these look so cute & delicious I think I might try to make these some time in the near future. 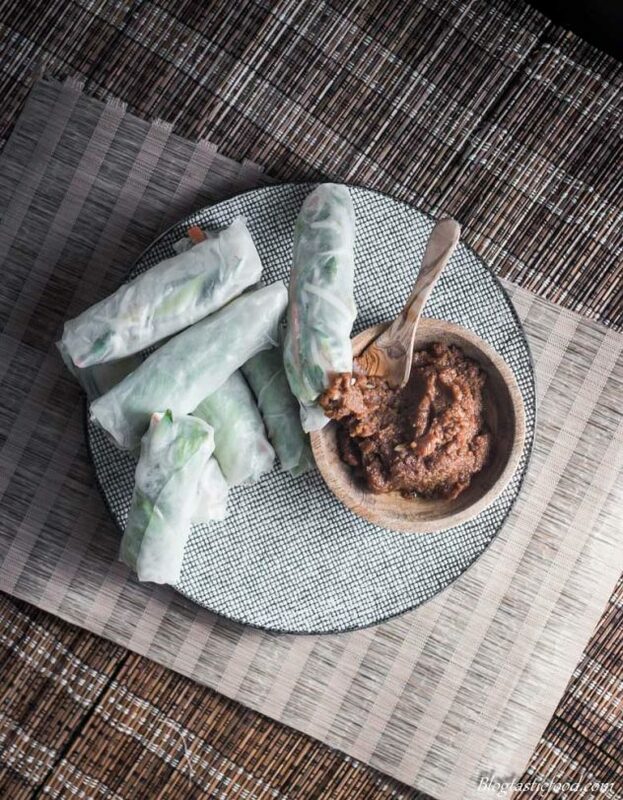 I love these summer rolls and hope to make them soon using fresh mint and Thai basil (I actually enjoy the flavour) I’m growing in my garden. I bought a package of Thai basil seeds from a seed catalogue and ended up with enough flowering plants that I could take the seeds from them for future growth. Here’s a picture of the seedlings grown in cardboard egg cartons. I haven’t taken a recent picture but here’s a link to an OLD post on my livejournal (I’ve only had a blog for a couple of years and I now double post to both) in which you can see one of my Thai basil plants and the Thai curry I garnished with some. I need to do some cooking with this summer’s crop. I attempted to subscribe to your blog but there was no active link found in the confirmation email. Suggestion? Oooohhh that’s strange, there is no blue underlined link saying “click here to confirm your subscription”? No blue link at all. The message was there but it wasn’t ‘live’. Thank you. I look forward to the new post. Wow it looks vry yummy! Hi Nick– we’ve had these only at restaurants– never made them at home. But your instructions make them look do-able! And I love the ingredients in the peanut sauce!! I’ll let you know how they come out when I give them a try! Pinning them! thanks. Thanks so much Rhonda I really hope you like it 😁 always appreciate your awesome comments. I do enjoy spring rolls, but sadly have never made them myself. I’m not sure I have any excuses anymore as your step by step instructions and photos make it so easy. This is a great post! Thank you! I’ve never seen rolls made with fillo pastry before. I’ve only ever used wonton wrappers, and I love playing with those. These rice wrappers really let the color come through, which is neat. I love ordering and eating Vietnamese spring rolls at restaurants, but I never knew how to make them myself. Thank you so much for this helpful step-by-step tutorial! I would love to learn how to make these.. I love the ease of you recipe I just may give it a try they look spectacular! Those look amazing! Nothing beats a perfectly cooked spring roll, and these sound like winners. Ahhhh yes wonton wrappers are also fantastic! But it certainly is nice to have spring rolls fresh every once in a while. What a yummy recipe I enjoy spring rolls but have never tried the Vietnamese version. Your recipe sounds delightful. Such a beautifully, well explained post on spring rolls. I love these and now I make them fairly well. But I remember my first attempt was an absolute mess. I was keeping them on a clean kitchen cloth which was a huge disaster. It kept getting stuck! only later did I realize I should not be using any cloth.. not to mention, no matter how clean.. there is lint in any clothing..
ah well.. I learned. Saving this as a refresher for next time. Omg, I have to try these rolls, it is amazing how detailed this recipe is! And you fried them!!! What an amazing idea! We certainly love our spring rolls but it’s been years since we made them. You do an excellent job of explaining and your photos are beautiful. We do like our food spicy and the peanut sauce sounds ideal. We don’t have a steamer but we do have a pasta pot with a strainer. We will give that a try. Gorgeous egg rolls! We love asian food in our family, we will be trying this recipe for sure. Thanks so much Marisa! They are definitely not the same without the dipping sauce. I really hope you like them and remember to spray a sheet of baking paper to make a surface for the rolls, otherwise they can stick. Your tutorial shows that it is so easy to roll a spring roll … I guess I am going to try if next week, wish me luck ! This recipe looks great, and Iove the tips to make them successful! I love spring rolls and love the balance of fillings in your recipe!